Avert your eyes from the unfinished floors in this room. I got ahead of myself when I ripped up all the carpet from the room I'd repainted. Until I get round to finishing it up let's just pretend there is lovely hardwood there. Now only concentrate on the dress. 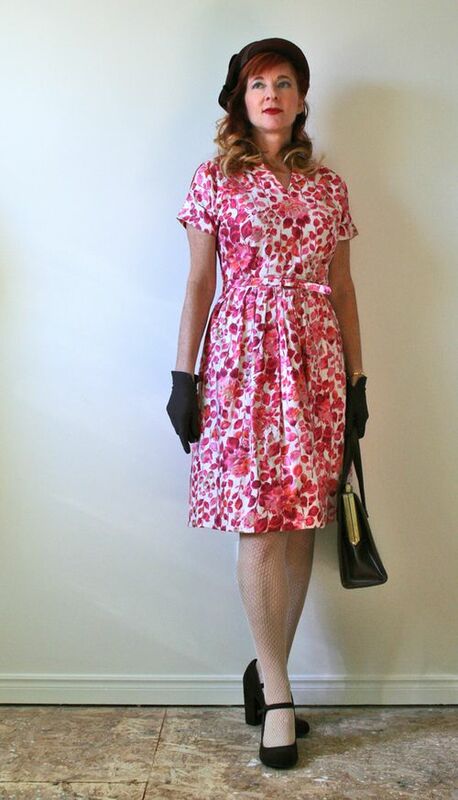 We are heading out to that 1940's dance this weekend and I tried out one of my possible outfits here with my Sweet Trash vintage 1940's hat, gloves and Ruche shoes. I won't be wearing the shoes for dancing, but might use them to make my *grand* entrance. I've never really "played" with makeup styles but I had to go all out for this. Without the bold lips this wouldn't look the same. Plus I'm kind of digging it now. My lips look bigger. Also…my hair has body and curl. It only took me watching an endless series of You Tube videos showing how to create pin curls and me swearing aloud in the bathroom for over an hour and a half with my arms crying out in pain while I tried to recreate the perfect curls without being able to see the back of my head. Thank heavens the only things I had to do was run to the bank, buy groceries and see all of the neighbours with my hair like this (only much messier). At this rate I will need to start getting ready for the dance at 8 am on Saturday. How did the gals of the 40's manage? 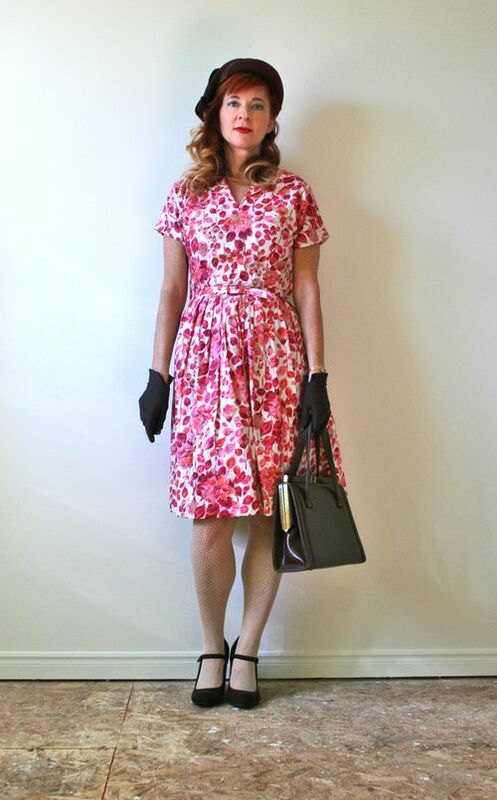 Hat, gloves and dress are all from Sweet Trash. Hangbag is also vintage. The dress is hand sewn. The gal that made it must have had a tiny shrunken head because the opening for it is super small and my dressing assistant (aka slightly annoyed husband) needs to help me in and out of it. So this is outfit possibility #1. I have 2 other possibilities. Handmade dress by Blackbird Studios not too far from where she lives. Yay for local fashion! STUNNING!!! You look like you stepped out of a fortie’s movie!!! OH! OH! OH! Beautiful! 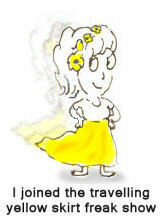 Very well done Suzanne…I’m already envisioning the dance…in black and white, of course…and you making a grand entrance! 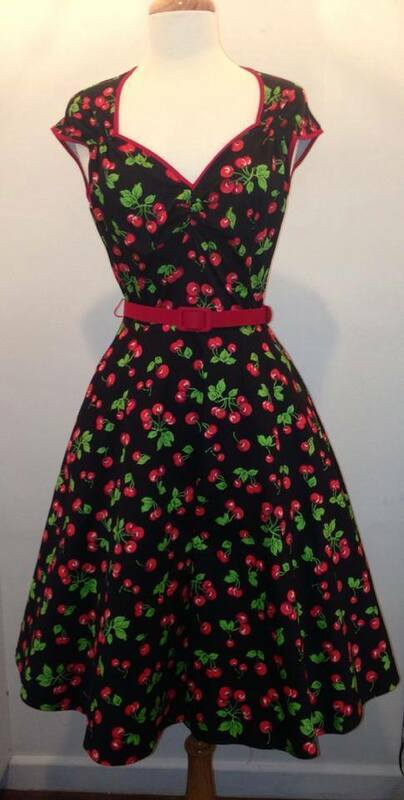 I am totally loving the last one with cherries, AMAZING DRESS! It is a keeper, would like to see you in this one! I can’t wait to see the other looks. Both of your dresses are amazing! Your attention to details on this outfit – wow! This is a beautiful post. I love 40s styling and you look so perfect. 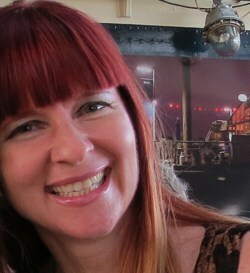 I’m looking forward to following your blog. you look stunning! i love the dress on you, and your hair and lips look great. i can’t wait to see the other looks! Both dresses are gorgeous- I love your whole look! And wait, there’s more- can’t wait to see what 1940s part 2 is going to look like. You look amazing – really the bees knees! That whole outfit looks great on you. That style is so fun. I would love to have some dance shoes that look like ’40s style. You definitely seem to have hit the 40s style perfectly here. 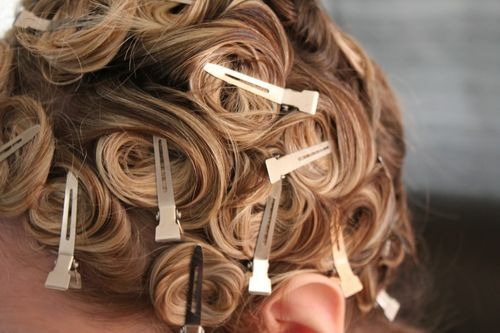 PS I think Rachel is right, the idea was to sleep on the pincurls and then make the curls last for a few days. It helped that their hair was generally shorter and cut for curls. I think they also utilized scarves to cover their curlers if they needed to keep the curls till the evening. 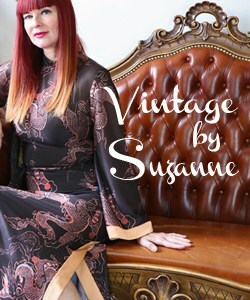 Katie of Butterflies love Snapdragons wears vintages and does that all the tme. Have fun at the event; can’t wait to read/see all about it! I adore the cherry dress and it gets my votes! Something I would enjoy wearing even now. You look like a stone cold fox straight from the 40’s! I can’t imagine how your other two choices can top this. And how about that hair? It looks gorgeous all bouncy and curly! Glorious. Fantastic. LOVE the sweet pattern on that dress, and the way the waist nips in, and those shoes, and the fishnets, and your hair, and….and…it is all fabulous. Have a swell time at the dance, mamacita! Well that is my girlfriend’s dress…so I won’t be wearing the same on as her. She did choose a nice dress though. The actual dancing shoes I’ll take with me look like proper brogues…so more 1940’s style but they don’t elongate my legs as much. I will let my girlfriend know that everyone is picking the dress she will be wearing. LOL Ah well. At least mine are vintage. the lipstick is a must. plus you look amazing in that color. love the whole look! You look prettier then ever. The outfit, of course, is fab. It suits you totally! Then the hair and the lips; just gorgeous!!!! 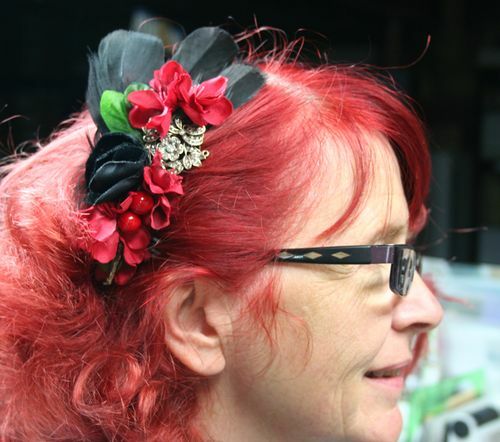 Your friend will look cool too, with her fun dress and hairpiece. Wow! Strange… i was sure I had commented… But cannot see it. I think this dress is also gorgeous. And the hair piece is so good. What a wonderful job. Hope you will show pictures of the two of you at the event.